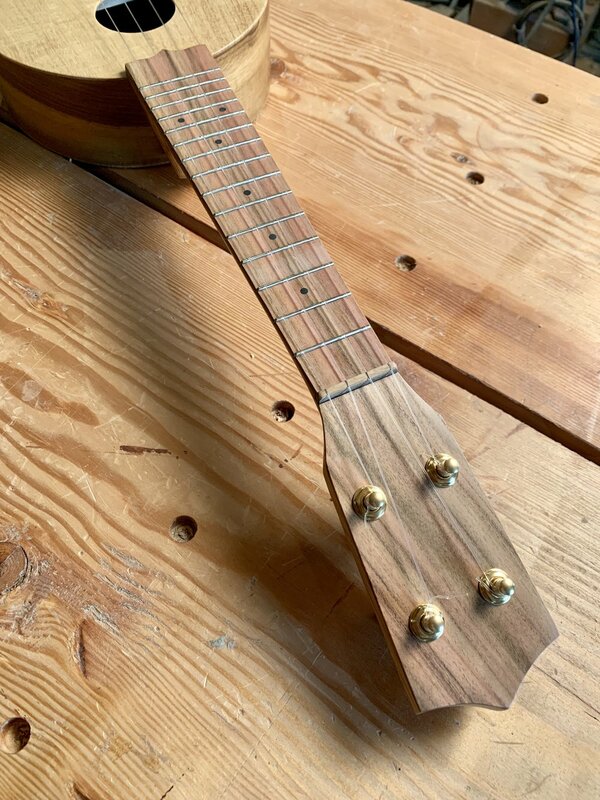 Sprouted from 8 years experience at Mya-Moe, the Beansprout ukulele is easy to play, sounds loud but sweet and sports a simple yet beautiful asthetic. 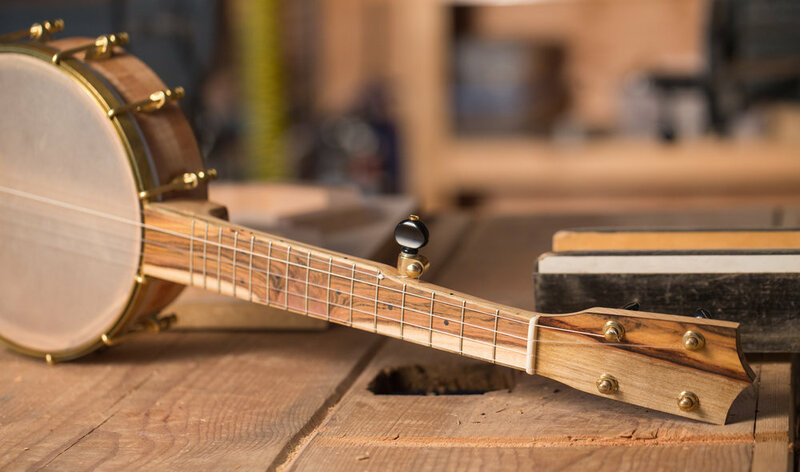 A focus on domestic woods, careful workmanship and a thin hand rubbed finish contribute to the feeling that this is a functional yet beautiful musical companion. Available in three sizes and many woods. -Available body woods include myrtle, mahogany, koa, sycamore, walnut, maple, cherry, pistachio, spruce, douglas fir and port orford cedar. Most from salvaged, re-claimed or sustainable sources. Confused on what to pick? Click here for more info and some suggestions. -Re-claimed douglas fir neck with pistachio stripe, peg head and heel cap. -Radiused pistachio fingerboard with 17 frets and black fret markers. -Gotoh geared brass and black tuning machines. -Pistachio bridge, bone nut and saddle, fluorocarbon strings. -GCEA High g or low g stringing for alto and tenor. DGBE for baritone. -Master grade wood, add $250-500, depending on species. The original Beansprout design with some stylish and functional upgrades. Available in walnut or maple, with pistachio accents. All North American wood and brass hardware. Loud but sweet, perfect for any style of music. -8 Inch walnut or maple block rim, with pistachio tone ring and rim cap. 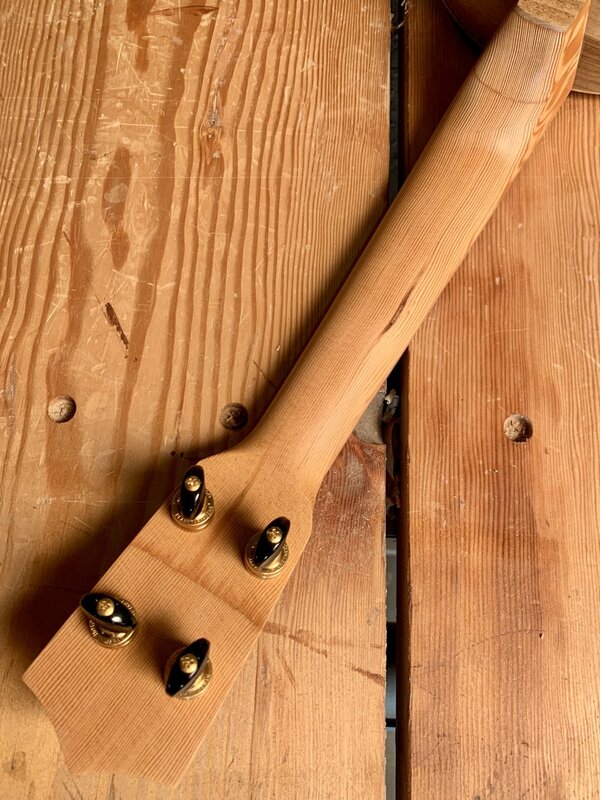 -Walnut or maple neck with pistachio stripe, peg head and heel cap. -Radiused pistachio fingerboard with concert (14.72") or tenor (17") scale length, 17 frets and black fret markers. -Un-plated brass hardware from Balsam Banjo Works. The brass tarnishes over time and develops a unique patina. Gotoh geared brass and black tuning machines. Renaissance synthetic banjo head. -Maple and pistachio bridge, bone nut, fluorocarbon strings. 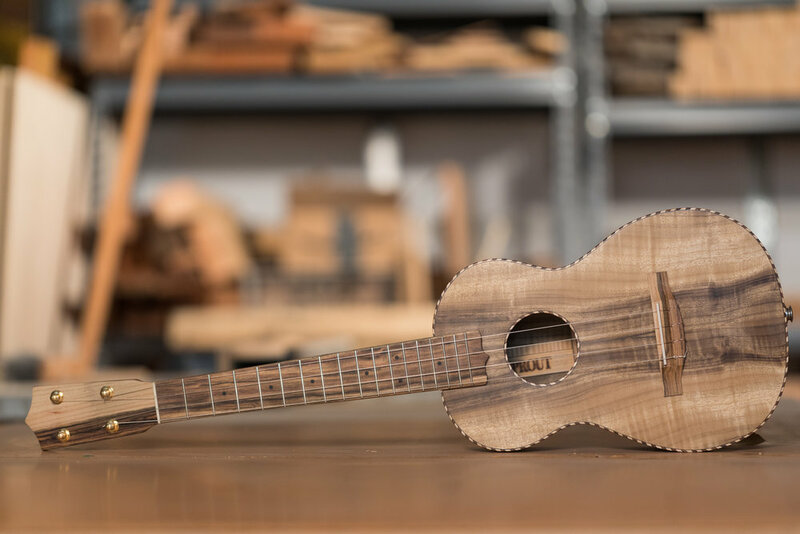 Inspired by the Lyon and Healy “camp uke” from the 1920’s-30’s, the Scout is a handmade ukulele with a simple design, sweet tone, easy playability and maximum portability. Not available to order, watch our email list or social media to see when they come up for sale. -Wood selection is Aaron’s choice, as he uses cut-offs and small parts from bigger projects. Domestic and sustainable woods are always a focus, including wood salvaged from old buildings, furniture makers and other unique sources with a story. -Soprano scale, flat pistachio fingerboard with 15 frets and black fret markers. -20.5” total length, 7.5” body length. -Pistachio bridge, nut and saddle, fluorocarbon strings. -GCEA High g or low g.
A fun hybrid of the five string banjo and the ukulele, perfect for banjo players looking for a smaller and higher pitched instrument or the uke player looking to branch out. I recommend cGceg tuning, but can be retuned easily to many nearby tunings. Available in walnut or maple, with pistachio accents. All North American wood and brass hardware. -Radiused pistachio fingerboard with tenor (17") scale length, 17 frets and black fret markers. Handmade in the USA with all domestic woods and hardware. An open back banjo that you will pass to your grand kids but want to play every day. With rich, vibrant tone and easy playability, it is suited for solo work or with a string band. -11 Inch walnut or maple block rim, with pistachio tone ring or rolled brass tone ring. -Pistachio fingerboard with 25.5" scale length, 17 frets, frailing scoop and black fret markers. -Un-plated brass hardware from Balsam Banjo Works and Brooks Masten. The brass tarnishes over time and develops a unique patina. Gotoh geared brass and black tuning machines. Renaissance synthetic banjo head. -Maple and pistachio bridge, bone nut, GHS strings. -Wood tone ring or rolled brass tone ring. Click here for warranty info.